Silver Spring, Md. 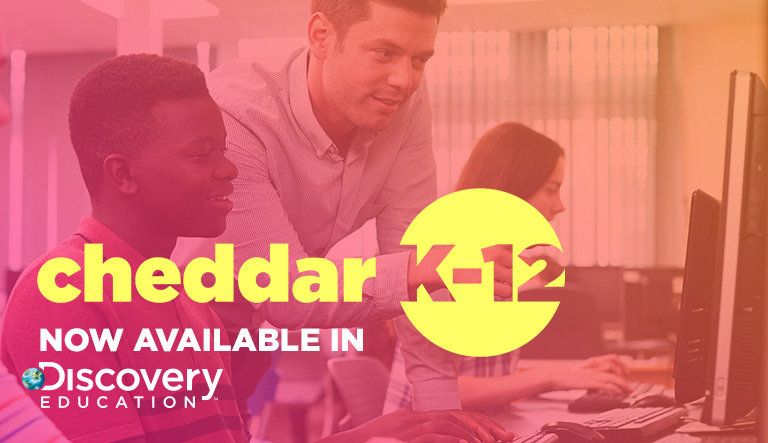 (January 24, 2019)–Cheddar, the leading post cable networks company, and Discovery Education, the leading provider of digital curriculum resources, digital content, and professional development for K-12 classrooms, today launched CheddarK-12, a new collaboration delivering the latest technology and business news to educators and students nationwide. Through this new partnership, Cheddar’s relevant, real world content will be integrated into Discovery Education’s award-winning Techbook Series, simplifying educators’ efforts to integrate current events into classroom instruction. Discovery Education’s Science, Math, and Social Studies Techbooks are currently used by approximately 5.6 million students across all 50 states and Canada. An immersive digital curriculum, Discovery Education’s Techbooks are aligned to rigorous standards and updated regularly at no cost. Each Techbook provides educators detailed lesson plans, embedded formative assessments, hands-on activities, digital simulations, and robust teacher supportsthat deeply engage students in learning. Discovery Education’s Science Techbook is built on the 5E model and helps teach students to read, write, and think like scientists through hands-on labs, digital explorations, an interactive glossary, data analysis activities, and powerful STEM resources. The Math Techbook is a digital textbook that connects students to math through real-world problems, helping all learners develop long-lasting mastery of mathematical concepts. The Social Studies Techbook uses an inquiry-based instructional approach that emphasizes informational text literacy, analytical writing, and problem-solving skills that students will apply in the classroom and beyond. A custom Cheddar Content Collection–featuring a mix of interviews with today’s newsmakers, long and short form business and tech videos, and innovative instructional strategies educators can use to seamlessly integrate CheddarK-12 content into teaching and learning, will also be added to Discovery Education Streaming Plus. A comprehensive digital service supplementing instruction across all K-12 curricular areas, Streaming Plus helps build students’ mastery in interpreting, understanding, and evaluating information. For more information about Cheddar, visit www.cheddar.com and follow on Twitter, Instagram, and LinkedIn. For more information about Discovery Education other digital resources and professional learning services, visit www.discoveryeducation.com, and stay connected with Discovery Education on social media through Facebook, follow us on Twitter at @DiscoveryEd, or find us on Instagram and Pinterest.